Julia Rich is a preacher’s daughter from Nashville. When Julia was three years old her mother, teacher June Blankenship, told Margaret Wright of the Middle Tennessee State University music department, “I’ll be sending you a singer.” Rich grew up singing in church choirs and at revivals held by her father, Rev. H. Fred Blankenship. Her fourth grade teacher, Mrs. Philpot, taught Julia to sing Faraway Places and prepared her for her first talent contest. A few years later, classified as a lyric coloratura, Rich received a Bachelor of Music degree from MTSU, having studied under both Margaret and Neil Wright. Julia picked up harmony singing from the Methodist hymnal and the Beatles. A fondness for Judy Garland led her to Tony Bennett and music that made you snap on 2 and 4. In college, she heard a Cleo Laine record and learned that coloratura chops were for more than arias. After a stint as a singing waitress at the Chattanooga Choo Choo complex, Julia performed in a theatre production of “Side By Side By Sondheim” and was offered a nightclub job, which paired her with jazz pianist/arranger Paul Lohorn and jazz bassist/arranger Joey Smith. This led to an independent study of jazz standards and singers like Sarah Vaughan, Peggy Lee, Ethel Ennis, Billie Holiday, June Christy, Ella Fitzgerald, Johnny Hartman, etc. Especially Ella Fitzgerald. Join the Miller Band; see the world. In 1985, Julia landed the role of Girl Singer with the World Famous Glenn Miller Orchestra. Joey Smith was playing bass in the band at the time and recommended her. Stanley Turrentine organist Butch Cornell played for Julia’s audition tape. Two audition tapes and one live audition later, Rich sang her first show with the GMO at the Opryland Hotel in Nashville on November 16. Touring with the Glenn Miller Orchestra has taken Julia to every state in the union, from one side of Canada to the other, throughout Central and South America, to the World’s Fair in Seville, New Year’s Eve in Reykjavik, and Easter in Tokyo during 24 tours of Japan. From the Hollywood Bowl to Lincoln Center, from the Place des Arts in Montreal to historic theatres and opera houses in the USA, Julia has sung for thousands of music lovers. 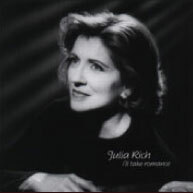 Julia Rich has sung Chattanooga Choo-Choo and Kalamazoo not only in Chattanooga and Kalamazoo but also from Reykjavik to Honolulu to San Salvador to Saskatoon. She has visited the faraway places with strange sounding names and was even able to sing and dedicate Faraway Places to Mrs. Philpot at a Glenn Miller Orchestra show, almost like she sang it in fourth grade. With the GMO, Julia has shared the stage with The Mills Brothers, Helen O’Connell, Rosemary Clooney, Mel Torme, Lynn Roberts, Kay Starr, Connie Haines, the Four Freshmen, Teresa Brewer, Jerry Vale, the Four Aces, Kathie Lee Gifford, Joan Shepherd, and former GMO leaders Buddy de Franco and Buddy Morrow. She has sung with the Tommy Dorsey Orchestra and the Cab Calloway Orchestra and shared the bill with the Jimmy Dorsey Orchestra, the Guy Lombardo Orchestra, the Harry James Orchestra and the Count Basie Orchestra, sharing a dressing room with Count Basie Orchestra singer Carmen Bradford during a show at the Hollywood Bowl where Ella Fitzgerald had appeared only a few days prior. Rich was vocal group director for GMO’s Moonlight Serenaders from 1989 through 2008. As a solo artist, Julia has sung for private functions and countless club dates including in Nashville at Mere Bulles, The Merchants, Clayton-Blackmon, and F. Scott’s; in Chattanooga at the Fairyland Club, the Chattanooga Choo Choo, and Union Square. She has entertained the Literacy Volunteers of America and the Middle Tennessee Choral Society, sung at Maximilian’s in San Francisco, aboard the Crystal Harmony and the Westerdaam cruise ships, impromptu at the Waldorf-Astoria in New York City with Helen O’Connell, the Village Vanguard in Sendai, the St. James Club in Osaka, and at night spots in Chicago, Sao Paulo, and Tokyo. Rich headlined the WMOT Jazz Festival and most recently did a 5-day stint for the W.C. Handy Festival in the Shoals culminating with an all-star tribute to Ella Fitzgerald. 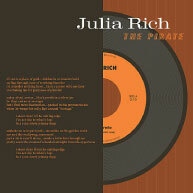 Julia continues to give Master Classes and private voice lessons. As a classically trained singer with a long history in commercial music and 17 years as vocal group leader for the Moonlight Serenaders, her teaching range is broad. 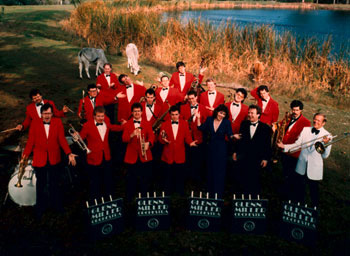 In addition to the players on the Glenn Miller Orchestra and in the studio (listed below), Julia has made music with the late John Propst, Eddie Edwards, Jeffrey Steinberg, Johnny Veith, Mark Vinci, Jim White, Lennie Foy, Lori Mechem, Roger Spencer, Charles Dungey, Rex Peer, Chris Walters, Butch Cornell, and Takehisa Tanaka. 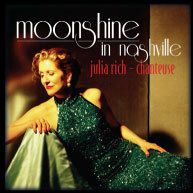 Julia’s original songs–The Irises, If I Spoke French–are featured on Music Choice: Singers and Swing. She wrote her first song in a piano practice room as a music major at Middle Tennessee State University. Rich is the sole writer on compositions including The Irises, If I Spoke French, The Way You Make Me Feel, Moonshine in Nashville, As Long as There’s A Morning. But Rich has also enjoyed a productive collaboration with hit singer and songwriter Benita Hill. Benita’s songwriting credits include a couple of #1 hits for Garth Brooks: Two Pina Coladas, It’s Your Song. Rich and Hill have both recorded their Two Afternoons in December which became part of the Glenn Miller Orchestra show, along with Rich/Hill’s My First Love. Other great tunes by the duo include Raining in Rio, Boyfriends, Working Girls, Wineglow, Holidays at Our House, and Frost Me. The Glenn Miller Orchestra also regularly performed The Irises, If I Spoke French, and Tete-a-Tete from Julia’s original catalog, deftly arranged for big band by pianist/arranger Tom McDonough. Strings were added to The Irises for GMO performances with symphony orchestras for their pops series. Rich’s solo recordings of both standards and originals are played regularly on TV’s Music Choice: Singers & Swing. 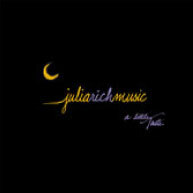 Julia Rich has recorded five full-length albums for Cardinal Records: I’ll Take Romance, The Way You Make Me Feel, If I Spoke French, Witch Hazel, and Moonshine in Nashville. 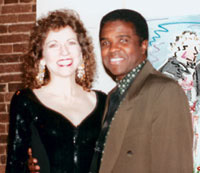 All recordings were produced by Julia Rich and Tony Migliore. Migliore wrote many of the arrangements especially for Julia’s original songs. Musicians and technicians who appear on these projects are listed below.